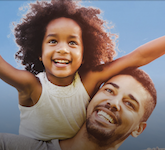 Featuring a joy-filled image of a father and daughter pretending to play “airplanes”, the City of Pickering has launched a marketing campaign to convince residents it would be fun to live beside an airport. Ignoring for a moment the palpable irony and insult-to-injury of portraying this as a “happy families” situation, given the decades of community destruction caused here by expropriation, let’s just consider the costs to taxpayers of such a risky business. When we recently challenged Pickering Staff for initially stating that the requested $150K from the Development Charges Budget was for an “airport study”, Staff quickly said it was a “mistake” and that the amount was actually for “community engagement”. And so it would appear that City Staff is requesting $150K to whip up enthusiasm for a Pickering airport in an election year, perhaps even funding a plebiscite. If this turns out to be illegal in the development budget, they will no doubt find a slot for it somewhere else. This mischief repeats the same mistake made by senior levels of government in 1972: promote a plan without sufficient background information to know whether the decision is remotely wise. Just consider: any time Council is presented with a plan for, say, a new strip-mall development, they demand the completion of a whole checklist of planning reports so they will know the municipal financial obligations/benefits before they make their decision. 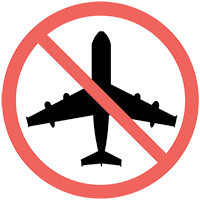 But when it comes to an airport, the same City is apparently unconcerned about promoting a story of nothing but benefits to the community without any idea (or mention) of the risks or costs they will be imposing on the municipality. For instance, who would own this regional Pickering airport? The average citizen assumes it would be the federal government, when this hasn’t been federal policy since 1994. Pickering might be made an exception in the interests of “regional development”, but that’s highly unlikely. The federal government is actually in the process of deciding whether it should sell some of the biggest airports, to reduce the annual costs of running Transport Canada and to be able to use the proceeds for other development projects. 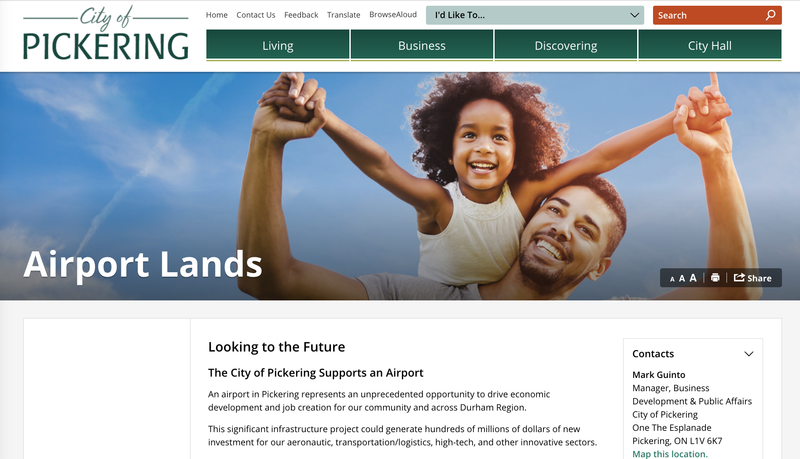 Dr Polonsky’s recent report on the Pickering Federal Lands makes clear that private investors view a Pickering airport as a high-risk investment. So that leaves the municipality as the potential owner. It’s been said that Oshawa should have known what was coming when Transport Canada sold them their airport for a dollar. Although Oshawa Municipal Airport is considered one of the best-managed small airports in the country, it still costs Oshawa ratepayers several hundred thousand dollars on a stand-alone basis each year. Even though it is, in fact, our regional airport, the Region wants nothing to do with taking over ownership at the expense of their ratepayers. Probably a very wise move. Waterloo’s airport costs regional ratepayers about $5 million a year on a stand-alone basis. Meanwhile, Mississauga is busy complaining that Pearson isn’t paying its fair share of municipal services costs. Why would Pickering want to join this crowd? 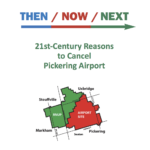 Pickering, before you promote anything as massively expensive as an airport, it is your fiduciary responsibility to call for a detailed study that will weigh all the risks, costs, and benefits. And the study needs to be done by a party universally considered by stakeholders to be completely impartial, outside the influence of the aviation sector. This kind of study is currently being conducted by KPMG under Transport Canada’s sponsorship. The City had previously said it would wait for the results of that study, due in 2018, before determining whether it agrees there is a business case to be made. We also ask you, City of Pickering, what financial burdens are you exposing your ratepayers to for all the regional and local municipal infrastructure that will be necessary should an airport go ahead, including the many road-widenings listed in the 2004 Pickering Airport Draft Plan? As one wag has put it, with 6-lane roads in north Pickering, at least it will be easier to pass the farm machinery! This whole thing smacks of irresponsibility. If you agree, please write the Mayor and Council to let them know your concerns. We encourage you to copy your local MP. « Together, we did it! !